Bill worked for the SWAB Wagon Company of Elizabethville, Pennsylvania, from the time he was in High School until he retired in 1986. His father and grandfather had also worked at the SWAB Wagon Company. The company began with making wooden wheel barrows and farm trucks before the SWAB Wagon Company grew into what we see today. Bill helped design a chick transport system and developed a blower system to make transportation more humane. He became interested in animal control and designed equipment and vehicles that not only provided humane transportation for domestic pets, but increased safety for Animal Control Officers as well. The ortho pet stretcher was also designed by Bill. Coworkers called him the “mad scientist” because his mind was always working on such creative inventions. Bill attended every NACA conference since exhibitors became a part of the annual meeting. Along the way, Bill supported NACA financially, emotionally and spiritually. He participated and initiated many of the frisbee-throwing events held at the past NACA conferences. Bill had a SWAB Frisbee especially made for these functions. Mackinaw Island/Grand Hotel – offering the largest porch in the country, was a great location for these events – that is until we were politely asked to take it elsewhere. Oh darn! 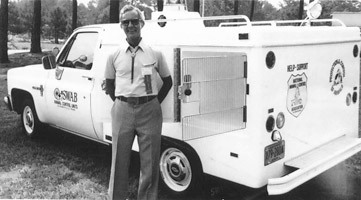 When Bill retired in 1986, he had worked for SWAB Wagon Company for 48 years. How many of us can say that? Few! NACA lost the physical presence of Bill Lehman when he died in April of 1988. His spirit and memory remains with us and will continue to be a part of NACA each year as we honor his memory with this award.